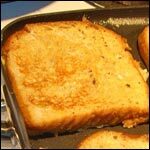 Here's all the recipes listed under Healthy French Toast along with the comments posted by the breakfast lovers that submitted them. "I'm a 'cinnaholic', so I LOVE French toast! Here's a recipe I made last night using just an egg white - it tastes great! Serve with warmed applesauce and/or fresh strawberries." "I know this recipe sounds ridiculously easy, but I cook a lot and I have to say that this is one of the best I've created. Simple, quick and unbelieveably good." 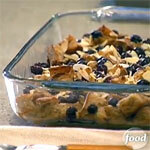 "A healthy take on a baked French toast casserole. Loaded with flavor and antioxidants." 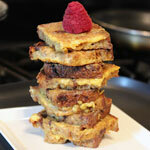 "This recipe comes from Hungry-Girl.com - a site highly recommended by Mr Breakfast. Explore the fun side of healthy eating and be sure to sign up for their excellent newsletter." "If you can resist having a pat of butter on top, this is healthy." "This recipe works well with any flavor of jam!" "This is my family's basic French toast recipe. It uses whole grain toast and skim milk, so you get taste and little bit of nutrition." 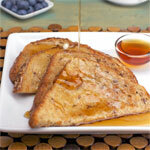 "I like this with maple syrup or jam on top. Bananas slices and vanilla yogurt is a fun topping too!" "You won't even miss the egg. It looks and tastes like regular French toast. Give it a try." "A sandwich maker machine works really well for this recipe too." "For more low-carb recipes try Mr Breakfast's Low-Carb Breakfast Index." "Hawaiian or French? Who cares. It's awesome." 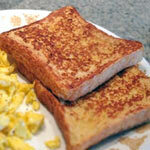 "Easy four-ingredient French toast where the egg coating mixture is prepared in a blender. Makes 6 to 10 pieces depending on the size and thickness of your bread." "Fairly healthy and fully delicious. Secret ingredient: pumpkin pie puree." "Anything goes topping-wise for this recipe: mushed banana, fresh berries, yogurt, jam, maple syrup or whatever you want to try. I hope you like it!" 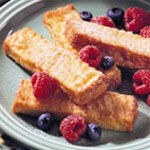 "Healthier than most French Toast recipes. You could try replacing the eggs with an egg substitute as well."